Thank you for your interest in our First Person on Scene (FFPOS) Course. Ballistic trauma or gunshot wound (GSW) is a form of serious physical trauma sustained from the discharge of firearms or munitions. The most common forms of trauma stem from firearms used in armed conflicts, civilian sporting, recreational pursuits and criminal activity. Ballistic trauma in most cases can be fatal for the recipient, or causes long-term consequences. Gunshot injuries from different types of firearms and ammunition vary in severity depending on the anatomic location involved and the different effects from the ballistic properties of the penetrating projectiles. Ballistic factors such as the impact velocity and energy should not be considered in isolation, as their specific effects are determined by the interaction between the projectile and tissues. Increased tissue damage can result from tumbling of non-deforming rifle bullets and deformation of expanding bullets. Both of these mechanisms increase substantially the energy transfer to the wound and its diameter, also producing a pulsating temporary cavity associated with pressure changes within tissue. The FFPOS has been designed to provide the necessary skills to manage firearm related injuries prior to pre-hospital care provider’s arrival on scene. The course revolves around an 8 hour intensive industry leading classroom and practical skill curriculum. The skills obtained in this course are around the immediate management of life threatening injuries caused by firearms of many and varied calibers. The management remains the same, rapid life saving intervention! This course is a ground breaking and unique course not offered at this level anywhere else in Australia. It has been designed with firearm or Gun Shot Wounds (GSW’s) being the sole basis of this training program. Participants will be exposed to injuries associated with ballistic related conditions of all calibers. 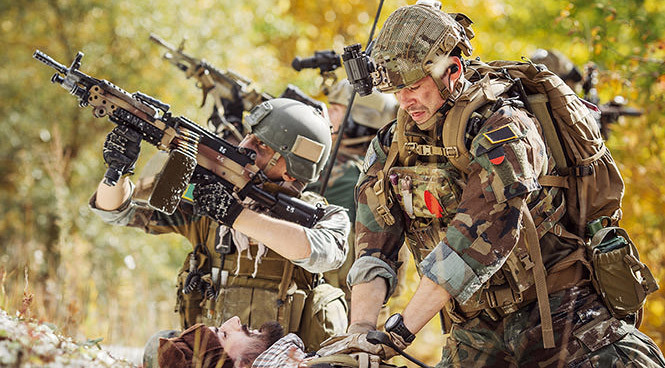 The necessary skills to adequately manage a patient in an Urban environment to sustain life from statistically survivable injuries until qualified pre-hospital care providers arrive to provide a continuum of care. It provides the participant with the skills to manage a patient whilst under fire, removal from danger and ongoing life saving management. Forms part of the competencies towards the AoFAQ Level 3 Award in the First Person on Scene Intermediate (RQF) qualification, as per the Security Industry Authority (SIA) of the UK. The Security Industry is one of the fastest growing industries in the world today. The course will provide exciting and challenging opportunities in a variety of areas. This unit of study will provide some of the units towards the AoFAQ Level 3 Award in the First Person on Scene Intermediate (RQF) qualification. Including but not limited to other first aid and pre-hospital qualifications, from supporting organisations. Further information can be made available on request.